Win $50 of Magic Today. Watch the Rising Card Carefully and Name it. 8/10/2016 So here we go again with another guessing contest. Watch the video. To win just guess which card is rising out of the deck. If you guess correctly you will win $50 of magic tricks! Watch the card and using all of your powers of the mind tell us which card it is and you win. If anyone guesses it in the first 4 tries you will win 2 extra tricks. 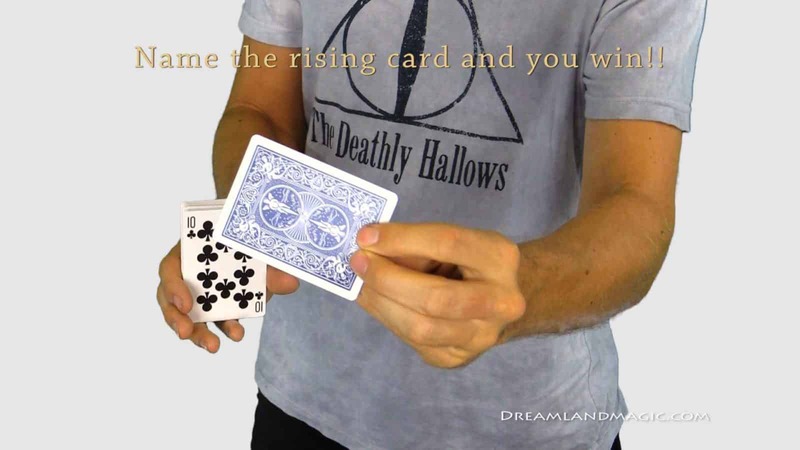 The magician causes a card to rise out of the deck with Rising Cards Deck. It is not a trick card but a real card from a deck of cards. This deck is a cool one and easy to learn without skill. You can make a chosen card rise and even have multiple people choose cards and they will rise one by one. You do not even need to hold the deck in your hand. No threads magnets used. Don’t be fooled by the cheap decks. This is constructed from a real Bicycle branded deck. Guesses have to be placed here. You can leave the comments on Facebook. To enter the magic contest just leave a comment below on what you think the rising card is. Be signed in with your user name from one of the accounts listed or registered at Dreamlandmagic so we can find you if you are the winner. If you anonymously guess the card you can not win since we do not know who you are! You can vote only once for this contest. You do not need to be registered to leave comments but to win you will need to be. This is also so the same person can’t guess 100 times! You will be disqualified for guessing multiple times. Contest may end without winner if the correct card is not guessed. $50 worth of magic tricks will be mailed to the winner free of any charge. If we can not contact the winner we will choose the second person to guess correctly. This entry was posted in Win Magic Contests. Bookmark the permalink.